This week on Other Bloggers Family Lives I am featuring Kelly from the self-named blog Kelly Allen Writer. Kelly blogs about her family, books, theatre shows and reviews, so let's find out more about the family behind Kelly Allen Writer. 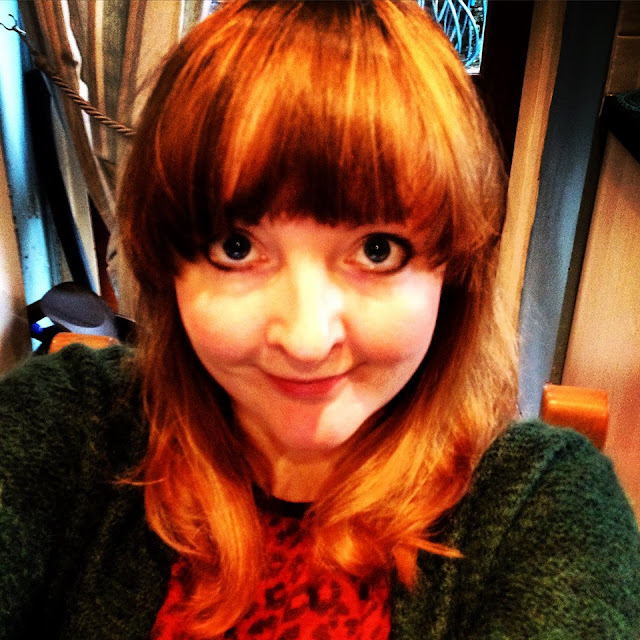 I'm Kelly and I'm a writer, I'm writing my first book and I started blogging over a year ago. My husband is called Warren and works for Lidl, he is a singer/songwriter/musician and he's gorgeous. We have two home educated children, George and Molly. George is 7 and is very wise, he's like an old man, always thinking and always right! Molly is 6, she's cute, loud and very kind. We live in South Wales. We have moved around a bit and we're currently in Llantwit Major but hope to move back to Llantrisant where we used to live, we miss it a lot! We love so many things - it's hard to choose. We love going on adventures and one of our favourites is a nice walk across the acre in Llantrisant. We also love going to the cinema and heading into Cardiff to explore. Of course, in Llntwit there's a beach!!! Llantrisant or Aberystwyth. They both hold a very special place in my heart. No. I'm from Birmingham originally ... My favourite memories would be spending summer a Kalamazoo hiding in trees and dens and hanging out with friends. I also loved spending time with my Dad who was a projectionist. I saw films for free and learnt a lot about behind the scenes in the ciname trade; it mostly involved chatting, tea and cakes. Ohhhh we're very last minute, as Julia Roberts says in Pretty Woman, "I'm a fly by the seat of my pants kinda gal!" Wow. Loads. I know it's not always plain sailing, but I love the love. When my children hold me tight, kiss me and tell me they love me. I also love overwhelming belly laughs, aren't they the best? I also love the simple times, watching movies, cuddling on the sofa and just being together. Thank you for taking the time to answer these questions Kelly, I totally agree that overwhelming belly laughs are the best, you can't beat the sound of your children's laughter. I have never been to Wales before but I keep hearing how lovely it is and would love to visit myself someday. I hope you have lots of spontaneous family adventures this year and get to move back to the town you were happy in. Awww i love this its great featuring other bloggers. Kelly... I would love to live in wales we have been to Bluestone and it was beautiful. what a fab place to grow up in. Lovely to get to know Kelly better and really agree with the love being the best thing about family life! Just followed you both, such a great post and wonderful read, extremely well written. Ahh I love Aberystwyth too! I'd definitely live round there if I could - dream place to live. We're going camping just south of there in less than a month and I can't wait. Lovely to find out a little more about Kelly - I'm also from Birmingham! Love finding out more about other bloggers!